Okay. Okay !I've only given you one recipe before, that of the everwonderful Cornell Chicken as it is part of the local culture. Here is another local culture thing. We take baked goods to any event imaginable from bake sales to school plays, to civic meeting to great big feedings (NYSMMA last weekend we fed around 1500 kids!!jeez!). Here is a good one for the masses out there and for the home team close by. Position rack in the center of the oven and preheat it to 400˚F. 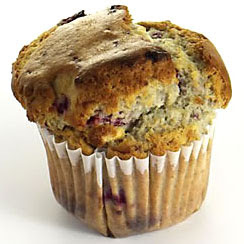 Coat the muffin cups with cooking spray or shortening. In a large bowl, whisk together the eggs, milk and melted butter (or canola oil). Place a sifter or sieve over the bowl and measure the flower, baking power, salt and sugar. Stir/sift the dry ingredients onto the wet. Stir just to blend; don't overbeat. Gently fold in the berries and grated lemon peel. Divide the baatter among the muffin cups, filling nearly full. Generously sprinkle granulated sugar over the top. Bake 20-25 minutes (in the case of the monster muffins--35 minutes), until the muffins rise and are golden brown on top, a cake tester inserted in te center should come out clean. Cool muffins on a wire rack. Serve warm. Summer is coming and so are the berries!